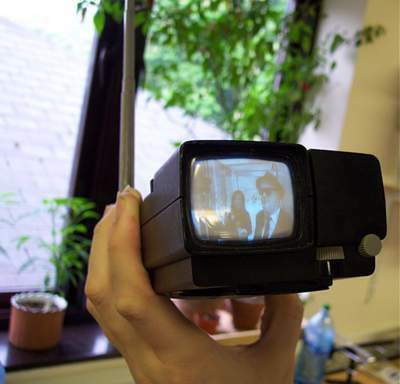 2-inch D5-100w CRT made by Telefunken. 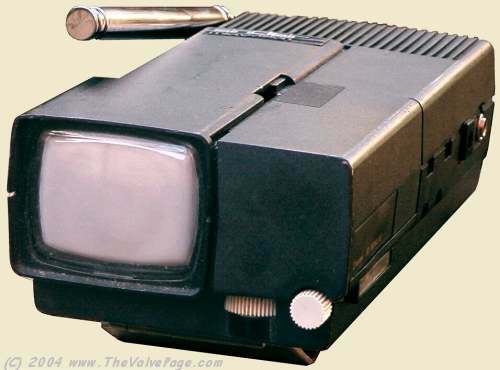 This is the second of the Sinclair "pocket" TV's, though you'd still need a quite big pockets, not just because of its size but also to store the cash needed to buy one. Still, it was half the price of Sinclairs first model, which was multi-standard (UK, America and Europe). Clean, works and has its original carry case, but is missing a few accessories. May 2004 NVCF for £30. Usually described on Ebay as "rare" or "very rare" by muppets that can't be arsed to notice that there is usually at least one for sale on Ebay at any one time. camera and not your own poxy Minolta junk. the credit of this set that it managed quite a good picture. Note chilli plants in background - see, w*rk is good for something !